We’re now well into the last 16 knock out games and, with the exception of surprise packages Costa Rica, the quarter finals are shaping up as most people expected. Hosts and favourites Brazil are safely through and they have been joined with Netherlands, Columbia and the aforementioned Costa Ricans. Today Germany play Algeria and France take on Nigeria. It’s fair to expect that Germany and France will still be in the competition by tomorrow, but in knock out football anything can happen. A moment’s lapse or a bit of bad luck can see you on that flight back home. The first game today is France v Nigeria. Nigeria raised a few eyebrows by seeing of Bosnia to secure their place in the last sixteen. They seem to have a bit of Jekyll and Hyde to their game. They were very poor against Iran before putting in a great performance against Bosnia. The introduction of Peter Odemwingie to the side seems to have given them a new dimension up front and he along with Emmanuel Emenike will need to be at their best for Nigeria to have any hope. France have been impressive from the word go. Only a slight stutter against Ecuador stopped France having a 100% record in the group stages. France were already assured qualification by this point and took the opportunity to give some of their second string a game so I wouldn’t put too much store in that result. Today France are odds-on favourites to get the win and frankly aren’t worth betting. Karim Benzema has been in great form so far and he is 4/1 with Ladbrokes or 3/1 with Bovada to score the first goal. He is also 4/1 with BetVictor, Coral and Bovada to score two or more goals. France are also a decent 21/20 with William Hill to win with a minus one goal handicap. Top Bet: Benzema to score first at 4/1 with Ladbrokes or 3/1 Bovada. A lot has been made of this tie being Algeria’s chance to get revenge over Germany following the ‘fix’ at the 1982 World Cup. Algeria were denied qualification in ’82 after Germany and Austria miraculously played out the exact result both sides needed to qualify at Algeria’s expense. It is a result that apparently still rankles in Algeria. This game is similar in that Germany are hot favourites to win and aren’t worth betting to win due to their restrictive price. I’m sorry to say that I can’t see either Nigeria or Algeria getting anything from these games. I would be looking towards goalscorers again as that is where the value is. Thomas Muller has led the way for Germany so far and at 7/2 with Ladbrokes and 10/3 with Bovada he is a good bet to open the scoring again today. Per Mertesacker is long overdue a goal. He is a big threat at set-pieces and is an attractive 10/1 with William Hill or 15/2 with Bovada to score at any time. Germany should win this comfortably and are 13/10 with BetVictor or 1/1 with Bovada to win to nil. 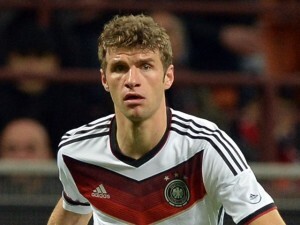 Top Bet: Thomas Muller to score first at 7/2 with Ladbrokes or 10/3 with Bovada.